The cold-shrink cable accessories is the made from flexible material (a commonly used silicon rubber and EPDM) by curing injection in factory, and then by expanding, add to plastic spiral (a variety of cable accessories components). when installation, pre-expansions were sets at the end of the cable or connectors, take out of the internal support, and pinched in the cable insulation on a cable and annex. Because it is depends on elastic recoil the commom temperature, and press on the insulator , so it is called cold shrink cable accessories. Chengdu Senfa Rubber&Plastic Co., Ltd.now commonly uses cold contraction of stress control, voltage from 10 kv to 35 kv. Cold shrink cable connector, 1 kv with cold contraction for enhanced insulation, 10 kv level with internal and external use of semi-conductive shielding layer of cold contraction joints insulation pieces. 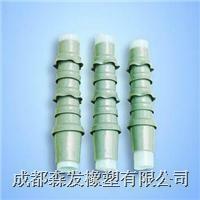 Three-core cable terminal is with cold shrink branch of the sets.